Creating tiny muscle-powered robots that can walk or swim by themselves -- or better yet, when prompted -- is more complicated than it looks. Rashid Bashir, the head of the bioengineering department at the University of Illinois, and Taher Saif, a professor of mechanical science and engineering at Illinois, will speak in Boston on the design and development of walking and swimming bio-bots at the annual meeting of the American Association for the Advancement of Science. 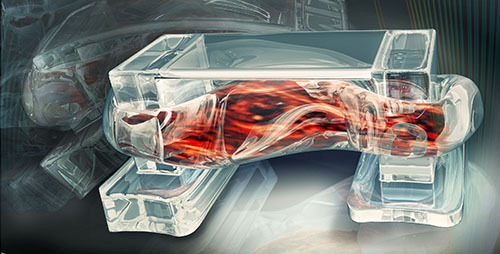 Tiny walking "bio-bots" are powered by muscle cells and controlled by an electric field. The symposium "Integrated Cellular Systems: Building Machines with Cells" was held Feb. 18 in at the Hynes Convention Center. Through the National Science Foundation-funded Emergent Behavior of Integrated Cellular Systems center, Bashir, Saif and colleagues have developed small, soft biological robots, dubbed "bio-bots," that can walk and swim on their own or when triggered by electrical or light signals. The researchers make a soft 3-D printed scaffold measuring a centimeter or two in length, seed it with muscle cells, and the cells self-organize to form functional tissues that make the bio-bots move. "These machines are now viewed as partially living, with the ability to form, the ability to age and the ability to heal if there's an injury," Saif said. "Now that we've got them working, we are beginning to look back and try to understand how the cells organize themselves and what language they use to communicate. This is the developmental biology of living machines." Miniature "bio-bots" developed at the University of Illinois are made of hydrogel and heart cells, but can walk on their own. In the talk "How to Engineer a Living System," Bashir will describe the methods that the group has used to build the bio-bots and to direct their behavior. "As engineers, we usually build with materials like wood, steel or silicon. Our focus here is to forward-engineer biological or cell-based systems," Bashir said. "The design is inspired by the muscle-tendon-bone complex found in nature. There's a skeleton or backbone, but made out of soft polymers similar to the ones used in contact lenses, so it can bend instead of needing joints like the body does." Bashir's group developed multiple designs to make bio-bots walk in certain directions and to control their motion with light or electrical currents. In the talk "Engineered Living Micro Swimmers," Saif will describe bio-bots that swim and the physical and biological interactions that cause the cells to come into alignment. 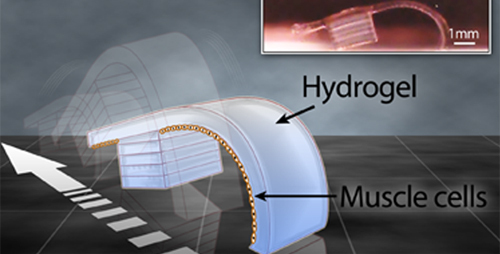 They form a single muscle unit that contracts to beat a tail, propelling the bio-bot through liquid. "They align themselves in a direction where the tail of the swimmer can be bent most. Which is exactly what we wanted, although we did not pattern or direct them to do it," Saif said. "Why do they behave this way? If each cell beat at its own time, we wouldn't have the swimmer. What made them synchronize into a single entity?" Bashir and Saif will share insights learned from these questions and more. "The objective is not to make a walker and a swimmer, but to lay the scientific foundation so we have principles for building biological machines in the future," Saif said.